Screencapture from the August 5 2015 episode of MasterChef, “A Little Southern Flair”. Episode available at Amazon Instant Video. We’ve had two team challenges in a row, so it’s nice to be back for a Mystery Box challenge! (At least this viewer thinks so.) Tommy is the first person we hear from tonight as they are entering the MasterChef kitchen. He feels really great to be in the top nine but it’s also really scary. There are eight others who want the title of MasterChef and he’s got to “stop these children” who are in his way! So, what will their next challenge be? They’ve survived a lot so far…and now it’s really going to heat up. Lifting their boxes, they find liquor and matches. Olivia is pleased and thinks they should do some shots. They have five different kinds of liqueurs to use and choose from in this challenge: bourbon, brandy, calvados, anise liqueur, and cognac. Nick says it reminds him of his college years. Booze and matches? That’s a recipe for disaster! Their challenge is that all dishes will have to be flambeed. The judges step forward to demonstrate the technique and to each prepare their own flambeed dish. Christina is making beef stronganoff and explains how burning off the alcohol in flambee cooking deepens the flavor. Graham is using anise liqueur to create a mussel dish. Gordon is using the calvados to make a peach and shortbread dessert. There’s a big showy display as the judges light up their pans, and I’m sorry, those flames sure look enhanced by special effects added in after the fact! The nine home cooks have 45 minutes and a limited pantry to make a “stunning” flambeed dish. Tommy is glad he’s not the only thing flaming in the kitchen tonight! Hetal is making almond shortbreads with a play on Old Fashioned cocktail, so she’s using bourbon as her liqueur. She’s used to working with spice but not really with fire. Tommy is going back to his roots with the famous Bananas Foster from the French Quarter of New Orleans. It’s a dish with a lot of drama and he loves to bring drama to the dinner table. Stephen has “magic happening”, he tells Graham. He’s doing a garden on a plate with sea bass flambeed in anise. He thinks Derrick is his biggest competition right now, and Derrick is also doing sea bass, and he’s using both anise and bourbon-flambeed elements in his dish. Derrick’s doing a very stylistic plate and seems pretty confident about making it into the top three. Katrina is doing sea bass with clams and fennel. She’s used cognac to go with a French bisque type flavor for her plate. The dishes are looking incredible, the judges say, and it’s going to be hard picking the top three. Time is called and who will be the first up for tasting? It’s a dish that combined two different styles of flambee and has a fruit component…Tommy. He’s made Bananas Foster with maple and bourbon cream, garnished with Granny Smith apples. Inside the crepes are a sweetened cream cheese and banana. Gordon says it smells incredible. It’s rich and delicious, steeped in alcohol but he’s burned off the right amount of liqueur. Graham says it has great flavor but the apple? It kind of comes from left field. 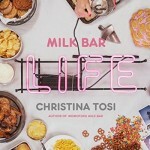 Christina is glad he went the dessert path. The flavors scream and shout and the pecans provide plenty of texture. The second dish? This person went down the seafood route and used the anise flavored liqueur: Katrina. She’s made pan-seared sea bass with a seafood stew of clams, bacon, fennel, and heavy cream. Graham says she keeps getting better and better. Gordon says the dish has rustic charm and he loves what she did with the fennel. The third and final dish is one that truly is restaurant quality and used sea bass as the protein: Stephen’s. He has sea bass wrapped in leeks, flambeed and then slowly braised with garlic, shallots and pecans. It’s “darn delicious”, Christina says and she would be blown away to get this dish in a restaurant. Gordon says the alcohol is cleverly used. So, who will get the “game changing” advantage in the next challenge? Congratulations end up going to Stephen. He’s excited that he’s finally won a Mystery Box and he’s feeling “electric”. So off to the pantry he heads, ready to “get this party started”! His first big advantage is that he doesn’t have to cook in the elimination. And he gets to chose what everyone else has to prepare, and he’s choosing from the food of the South. Christina grew up in Virginia and she’s picked shrimp and grits: simple, homey but hard to get right. Graham has chicken and waffles. Two totally different techniques. Gordon has the “pride and joy” of New Orleans: gumbo, a dish which can easily go wrong. Which dish will he chose? The answer is revealed back in the kitchen and it’s no real surprise to me: chicken and waffles. (We know how frequently people mess up cooking chicken on this show, and fried chicken is especially hard to get just right!) Tommy loves chicken and waffles… “More than the church loves sin!” He seems quite confident he can pull this off. Everyone will have 60 minutes to make their dish – well, except for one person. 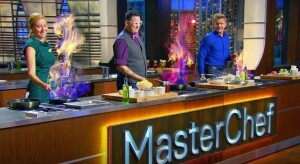 Stephen gets to chose one person who will only have 30 minutes to cook. Everyone rushes into the pantry, even Derrick although he’s going to hold back while everyone grabs their chicken selections and gets to work. Shelly says she was raised in the South so she can’t wait to “kill” this one. A lot can go wrong with this challenge, between making the best waffle and frying the chicken so it’s crispy and browned on the outside but still cooked through inside. Nick is doing a “Southwest” chicken and waffles with horseradish. Claudia says she loves to make fried chicken and waffles with her “munchkin” at home. Tommy is doing duck-fat fried chicken and he’s in his comfort zone. Katrina is doing miso fried chickens with scallion waffles…sort of an Asian-inspired dish. Meanwhile, Stephen is taunting Derrick from the balcony once he finally gets to start cooking, 30 minutes in. Gordon talks like he doesn’t think Derrick can do it with that time penalty. But of course, if you’ve watched MasterChef enough before then you know that people in these kinds of targeted challenges always manage to pull it off in the end, so I’m not too worried about Derrick here. Christina checks in with Hetal. She’s making her waffle with cornmeal and onion and a buttermilk fried chicken. Shelly is redoing her waffles because she’s not liking the browning on them. She’s familiar with this dish but she might be psyching herself out. Derrick is cool as a cucumber and says this was a wasted penalty from Stephen since he won’t sacrifice his standards, no matter what. The judges think Hetal’s dish looks good but Shelly could be in trouble because she’s too much in her head. Time is called and first up is the person who was up against it the most: Derrick. He’s a little nervous and he hopes they admire his effort. He’s made buttermilk chicken and waffles with spicy blackberry-maple reduction. The chicken is nice and crisp, seasoned beautifully. It tastes better than it looks, Gordon says. He’s amazed he got it done in thirty minutes. Graham says the glaze is awesome with tons of flavor. The chicken is a little dry with him using the chicken tenders but he didn’t have a lot of choice given the time pressure. Hetal is next with her cornmeal waffle with ginger-nutmeg Indian spiced fried chicken. She also used chicken tenders, to play it safe since drumsticks take longer to cook. Did she make Christina proud? After a psych-out and commercial break, the answer is yet, of course! It is really delicious. It reminds Christina of home but also her favorite dish at an Indian restaurant. So, two good plates in a row, which means next up we should have someone who’s not been so successful. That would be Claudia. She says waffles is something she makes for her daughter every weekend and she makes this chicken all the time. She’s confident with her cayenne-buttermilk friend chicken, lemon-thyme sweet waffle, and citrus glaze sauce. “Wow,” Gordon says. “This. Looks. Terrible.” It looks like something from a diner. The chicken is still pink on the bone. She should have put the chicken in the oven as soon as it came out of the fryer. The waffles are embarrassing, soft, spongy and horrible. Claudia has no words, this is the first time she’s at the bottom and she doesn’t like it. Nick is next with his “Southwest” chicken and waffles, with orange zest and rolled oats in his waffles, a horseradish maple syrup, and pink peppercorn compound butter. That just sounds like a horrible combination of flavors to me and sure enough Graham isn’t impressed. Horseradish has nothing to do with southwestern cuisine. Katrina has miso fried chicken with scallion waffles and peach hot sauce and compound butter with honey and chives. She wanted to do something different but Gordon says “Miso disappointed” (ouch). The chicken tenders are dry and it’s not her at her best. Olivia has an orange and ginger waffle with a soy-glazed chicken topped with sesame seeds and cilantro. Christina tells her the toasted sesame seeds saves the chicken but the breast is dry. The waffle is “OK” but she could have done a lot better. Next up is Tommy. He’s happy with his dish and he thinks his chicken looks like solid gold. He has duck-fat friend chicken with pecan-quinoa-corn waffle and tomato-whisky marmalade. The chicken is incredible, Gordon tells him and it’s authentic, delicious, and it’s one of his best dishes he’s performed so far. Graham says it’s “righteous stuff”. The marmalade jam needs to be bottled up and sold. Last up is Shelly. She’s not 100% happy with her dish but she’s hoping the judges like it. She has classic chicken and waffles with bourbon maple syrup. Gordon notices the chicken has been cut into to make sure it was done, but it’s actually still pink inside. She left other pieces of chicken on her station which she says was cooked, so why did she serve an under-done piece? The chicken is undercooked and bland. At this stage of the competition it’s not sufficient. Has she given up? She says she’s been second-guessing herself but she knows she can do better. She’s hoping the judges can see beyond this dish. There were two stand out dishes: Hetal’s and Tommy’s. They will be team captains in the next big challenge. The bad news? The overall two worst dishes were by Shelly and Claudia. It’s Claudia’s first time in the bottom and the judges are shocked to see her down there. Gordon believed in Shelly early on and he still believes in her, but he believes she’s gone as far as she can in this competition. Claudia is safe and Shelly is going home. All I can say as a viewer is that it’s about time! Although I had earlier picked Shelly as my guess on who would win season six, that choice on my part was not based on her apparent skills but on the editing and how the judges seemed to be favoring her/cutting her a lot of slack (especially Gordon). But after a few successes early on she’s been consistently near the back of the pack, just barely escaping elimination and clearly not being looked at as a good team player by the other home cooks. Shelly really should not have even made it into the top ten, so I am glad to see her gone at last. Both Olivia and Nick seemed to be floundering/stuck in the middle this week with sub-par performances. I definitely think Derrick will be in the finale at this point but he will NOT be the winner. He’s the good foil, the technically excellent cook, that they love to put up against someone with more “heart” (or more likely to tug on the viewer’s heart strings.) At this point I think it could be Claudia, Katrina or possibly Hetal in that place, if Hetal doesn’t crash and burn next week given it’s a vegetarian dinner challenge. I could just see her being given that “huge advantage” yet having her team fail, and then with an elimination pressure test featuring head meat? That would probably be a vegetarian’s nightmare. Stephen is the wild card in all of this for me. I can’t see them thinking they could market a cookbook around him. But he is a great chef and sure has brought some needed energy to this season. All told, at this point, I think it’s a pretty solid top eight with no one left who really doesn’t deserve to be there. I also thought “About time!” when Shelly was eliminated. I felt she should have gone that time when Gordon spat out her “ground beef and strawberries in a condom” dish, but mysteriously she stayed. I won’t have to listen to her snarky remarks and watch her eyes rolling all of the time (funny that she doesn’t get picked up for that by Headmistress Christina). I enjoy the episodes close to the business end of the season. One really can’t hide in the middle any more and you have to cook well every time to stay in contention. It’s also the time when you wonder which cookbook and person will be the most marketable. I think that a cookbook from Stephen, combining the urban garden and food would be among the most interesting, but I wonder if he’s too odd and unpredictable to market successfully. I thought his taunting of “The Little Drummer Boy” was unnesessary and rather childish. Scenes like that make me less likely to want him to succeed. 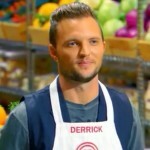 I haven’t really got a feel for Derrick’s cooking as it’s so overshadowed by his immense ego. You said “Derrick’s doing a very stylistic plate and seems pretty confident about making it into the top three” and that is something that happens quite a lot – he disparages the other dishes, insists his is the best there, but rarely makes the top three (only once from memory), so I wonder if he’s as good as he clearly thinks he is. I’ve warmed a little to Tommy, but haven’t really seen any stylish plating from him. In fact, this year, the plating of the food has been far below the standards of previous years and much more “slapperd on the plate” in a hurry in the last seconds. But Tommy has been in a winning position a few times and he may make number one. Personally, I’d like to see a book from Katrina as she seems to cook interesting food that I’d like to try. Claudia could also be easy to market and people do seem to like Mexican flavours. Hetal’s book would only be for a niche market who likes Indian vegetarian food and I read somewhere that Olivia is a vegan, so that’s even more a niche market. Anyway, I think that she or Nick will be the next ones eliminated, based on their lacklustre performances lately. It’s always hard to tell with a team challenge as you don’t know who will be in the losing team, but I think one of them will go this week. Neither Tommy or Hetal strike me as effective team leaders, so I expect a lot of drama in the kitchen this week. As you noted, you’d think that Hetal has a big advantage in a vegetarian challenge (I bet she chooses vegan Olivia for her team as well), but I’ve seen people lose spectacularly on what appears to be a perfectly tailored challenge for them. The pressure test looks gruesome, so I’d want to avoid that at all costs!